A sixth-generation Oklahoman, Nathan grew up in Weatherford and south Oklahoma City, where he graduated from Westmoore High School. He attended Wake Forest University in Winston-Salem, North Carolina, earning a B.A.degree with honors in religion and a minor in philosophy. After returning to Oklahoma, Nathan earned a master’s degree in professional writing from the University of Oklahoma in 2007. At OU, he served as an intern at NPR affiliate KGOU and worked on a student-produced episode of the History Channel show The HISTORYCenter. A former intern and contributing writer for the Oklahoma Gazette, in 2011 Nathan was awarded First Place in Editorial/Commentary by the Oklahoma Society of Professional Journalists. His byline has appeared in numerous print and online publications. 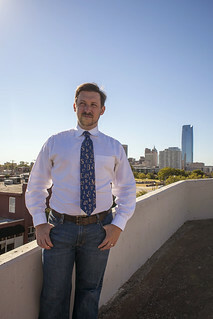 For five years, Nathan served as senior communications specialist at Oklahoma City University School of Law, where he played an integral part in its 2010 website redesign, an effort that earned first-place honors from the Oklahoma Society of Professional Journalists in 2011. In addition, the OCU LAW magazine, for which he served as executive editor, received multiple awards. Nathan became Oklahoma Today’s managing editor in August 2011 and is responsible for overseeing much of the magazine’s website and print content and writing stories on a variety of topics. He was named 2012 Magazine Writer of the Year at the Great Plains Journalism Awards and was awarded second place in Best Reporting Portfolio by the Oklahoma Pro Chapter of the Society of Professional Journalists.